Ab28061 recognises CD14 expressed strongly on the surface of monocytes and weakly on the surface of granulocytes; also expressed by most tissue macrophages. Ab28061 also recognises soluble forms of CD14 found in serum and in the urine of some nephrotic patients. Full length native protein (purified): A crude mixture of human urinary proteins precipitated by ammonium sulphate from the urine of a patient suffering from proteinuria. The antibody is free of unconjugated FITC. Our Abpromise guarantee covers the use of ab28061 in the following tested applications. 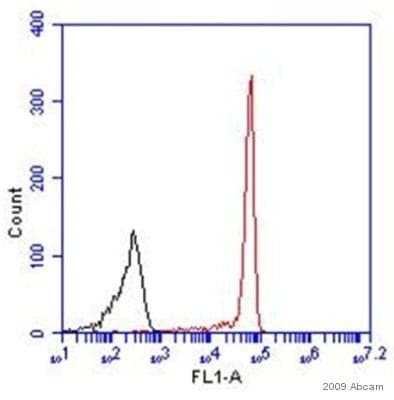 Flow cytometry analysis of human peripheral blood cells labelling CD14 with ab28061. ab28061 staining CD14 in human peripheral blood monocytes by ICC/IF (Immunocytochemistry/immunofluorescence). Cells were fixed with 2% paraformaldehyde for 20 minutes at room temperature and blocked with 2% goat serum for 15 minutes at 25°C. 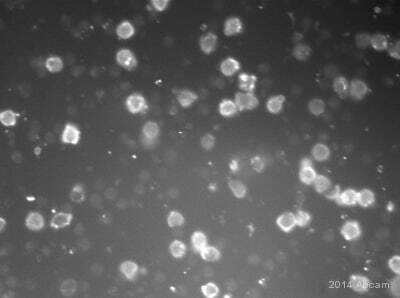 Samples were incubated with the undiluted primary antibody for 45 minutes at 25°C. 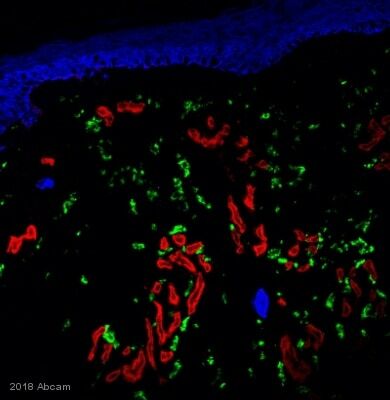 ab28061 staining CD14 in peripheral blood mononuclear cells by flow cytometry. The fibroblasts were prepared using 10 uL FITC antiCD14 to 50 uL (~100,000) cells in PBS/5%FCS and incubated on ice for 45 min. Cells were gated on viable cells. Publishing research using ab28061? Please let us know so that we can cite the reference in this datasheet. Thank you for your inquiry. We do not recommend to freeze this antibody and to especially avoid freeze/thaw cycles. But I would like to recommend to run a test experiment. Antibodies in general are very stable and as long as the conjugate did not get damaged by the freezing, the antibody might work just fine. I am especially optimistic since there were no freeze/thaw cycles involved. Unfortunately, we can only guarantee our products to work if they were stored as instructed and cannot make any assumptions on the quality of this antibody after freezing since this was not tested by us experimentally. I wish you good luck with the experiment and hope that the antibody will work well for you.